Master Suite on main deck forward, two double cabins and two twin cabins on lower deck all ensuite. With over ten years in the yachting industry and a lifetime of experience around boats, Nic has gained invaluable experience around the globe. Cruising areas as far north as Norway to as far south as New Zealand with the Caribbean, Bahamas, Florida, Maldives and the Mediterranean in between. Nic spent the last year chartering throughout the Caribbean and Bahamas, learning some of the best kept secrets throughout the islands. 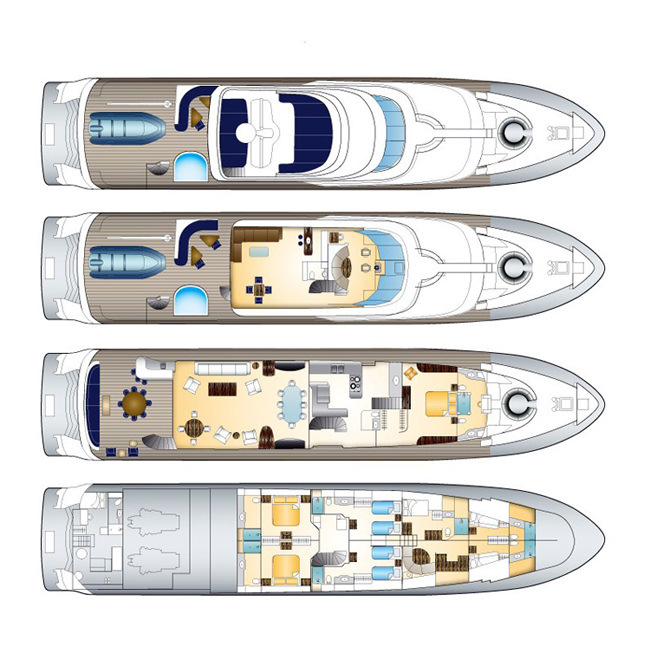 With advantageous experience working on a variety of different yachts, Nic looks forward to joining DONA LOLA and welcoming charter guests aboard for a unique and luxury experience unlike any other! Sarah was born in London though moved to Sydney Australia when she was 6 years old. A desire to see the world lead Sarah to sailing from Argentina to the British Virgin Islands in the Caribbean, where she discovered a love of sailing, scuba diving and the ocean. She was introduced to professional yachting in the Caribbean where she worked in the demanding charter yacht industry. Sarah has spent the past 13 years working on yachts where she has cemented her hospitality knowledge and furthered her diving qualifications. Sarah hopes you enjoy your time onboard, feel free to ask for anything you need. Born in Colwin Bay, United Kingdom, February 27. Adrian was trained in the classic French manner, but due to his travel experience he now has a global culinary perspective. Adrian has been in the yachting industry for over 15 years and has catered to a wide variety of guests, from politicians to Hollywood celebrities. Your taste buds are in for a real treat, so sit back, relax and know that your culinary experience onboard Dona Lola will be exquisite. CHIEF MATE: Bio coming soon! Pete was raised in a small country town with The Great Barrier Reef and coastal rivers as his backyard. An avid fisherman, snorkeler and diver from a very early age. Pete enjoyed all aspects of the ocean. Pete entered the engineering sector initially as an aircraft engineer with a particular focus on helicopters. He moved to the Caribbean 8 years ago where he discovered the yachting industry and began his career on yachts. This has allowed him to combine his love of the ocean with his engineering skills. Pete hopes everyone enjoys their time onboard M/Y Dona Lola. Feel free to ask him for any assistance at anytime. Other Toys: Note 1: Large Towed Tender: 30' Intrepid w/ 2 x 300HP Yamaha outboards. Note 2: Full complement of scuba and snorkel equipment. - Two Bladefish Sea Jet 5000 Turbo Underwater Scooter DPV for either diving or snorkeling. - Assortment of beach toys and games.